7.0 mm Flexible Cable O.D. 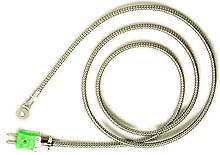 Rugged thermocouple, for surface mount applications. Rated to 480°C, has a washer mounting surface and an overall dimension of 17.3 mm O.D., with a 6.6 mm mounting hole of SS material. Attached to the mounting surface: 2 m of SS flexible armour cable with stripped wire ends. Armour cable has 7.0 mm O.D., with 1.8 mm washer thickness. Standard thermocouple plugs are available for cold-end termination.